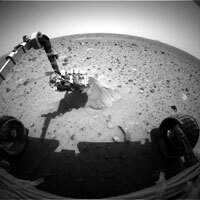 Spirit's rover arm reaches out to Adirondack. Scientists today reported initial impressions from using Spirit's alpha particle X-ray spectrometer, Mössbauer spectrometer and microscopic imager on a patch of soil that was directly in front of the rover after Spirit drove off its lander Jan. 15. One unexpected finding was the Mössbauer spectrometer's detection of a mineral called olivine, which does not survive weathering well. This spectrometer identifies different types of iron-containing minerals; scientists believe many of the minerals on Mars contain iron. "This soil contains a mixture of minerals, and each mineral has its own distinctive Mössbauer pattern, like a fingerprint," said Dr. Goestar Klingelhoefer of Johannes Gutenberg University, Mainz, Germany, lead scientist for this instrument. Scientists were also surprised by how little the soil was disturbed when Spirit's robotic arm pressed the Mössbauer spectrometer's contact plate directly onto the patch being examined. Microscopic images from before and after that pressing showed almost no change. "I thought it would scrunch down the soil particles," Squyres said. "Nothing collapsed. What is holding these grains together?"